Copyright © 2013 Ian Brown, Jill Gould. This is an open access article distributed under the Creative Commons Attribution License, which permits unrestricted use, distribution, and reproduction in any medium, provided the original work is properly cited. BACKGROUND: There is a developing interest in qualitative research to understand the perspectives and experiences of people living with obesity. However, obesity is a stigmatised condition associated with negative stereotypes. Social contexts emphasizing large body size as a problem, including research interviews, may amplify obesity stigma. This study reviews the methodology employed by qualitative studies in which study participants were obese and data collection involved face-to-face interviews. METHODS: Database searches identified qualitative studies meeting inclusion criteria from 1995 to 2012. Following screening and appraisal data were systematically extracted and analyzed from 31 studies. RESULTS: The studies included 1206 participants with a mean age of 44 years and mean BMI of 37 kg/m2. Women (78.8%) outnumbered men (21.2%) by four to one. Socio-economic background was not consistently reported. The studies employed similar, typically pragmatic, qualitative methodologies, providing rich textual data on the experience of obesity derived from face-to-face interviews. The majority considered quality issues in data collection, analyses and generalizability of findings. However, the studies were weak as regards researcher reflexivity in relation to interviewer characteristics and obesity stigma. CONCLUSIONS: The impact of obesity stigma has not been attended to in the qualitative research. Clear information about study participants is essential, but studies involving face-to-face interviews should also report on interviewer characteristics including body size. Qualitative studies have become an accepted methodology within health research [1-2]. Advocates note the strength of qualitative methods in delivering a greater depth of understanding of, for example, the complex phenomena faced by patients living with long term conditions [3-4]. Appreciation of the methods, quality criteria and reporting standards needed for rigorous qualitative research has also become established; and a number of excellent checklists and guides are available [5-7]. Systematic reviews and syntheses of qualitative studies are recognized as a useful contribution to evidence and policy development [8-9]. Core definitions of qualitative research point up the value of flexibility within an emergent design in which textual data are acquired to explore social phenomena in context . In practice, in health and medical research, the data are typically gathered from individual or group interviews or, less frequently, from observation of interactions such as between patient and clinician within a consultation. Analyses typically proceed through iterative stages of coding data to inductively develop, for example, themes, frameworks and theories . Building on previous guidelines and an extensive literature review, the COREQ checklist is useful for studies employing interviews and focus groups . Criteria are grouped within three domains. In the first, labeled “research team and reflexivity”, attention is drawn to how characteristics of the research team and relationships with participants affect responses, interpretation of data and hence credibility of findings. The second domain highlights how the study’s theoretical framework (methodology), sampling, setting, data collection methods affect study quality and findings. The third domain focuses on data analysis, interpretation and reporting. Obesity is viewed as a long term medical condition and is currently one of great concern for public health because of obesity’s increasing prevalence and the associated risks for diabetes and other chronic diseases [12- 14]. There has been growing interest in the perspectives and experiences of patients living with obesity and a developing appreciation of the degree to which obesity is a stigmatized condition, associated with negative attitudes and discrimination in many countries [15,16]. People who are obese face difficulties in various spheres of life, such as in education and employment. Derogatory portrayals of obesity are common within the culture and media of these societies. Stigma is the phenomenon in which societal evaluations negatively impact on individuals’ sense of identity and self-presentation . In some societies, obesity brings a strongly devalued physical and moral identity, creating challenges for those affected by obesity in managing their identity and in presenting themselves in social interaction. Obesity stigma has general consequences in many spheres of life for affected individuals. However, interactions oriented to obesity and therefore emphasizing large body size as a problem, are a context in which stigma will be amplified . This has important, but uncharted, consequences for research about obesity, particularly, research involving face-to-face interaction in data collection. In this paper, we report on a literature review of qualitative studies in which the study participants were adults categorized as obese and the data collection involved face-to-face methods. We employed established methods in searches, appraisal, data extraction and analysis of relevant literature [17-19]. 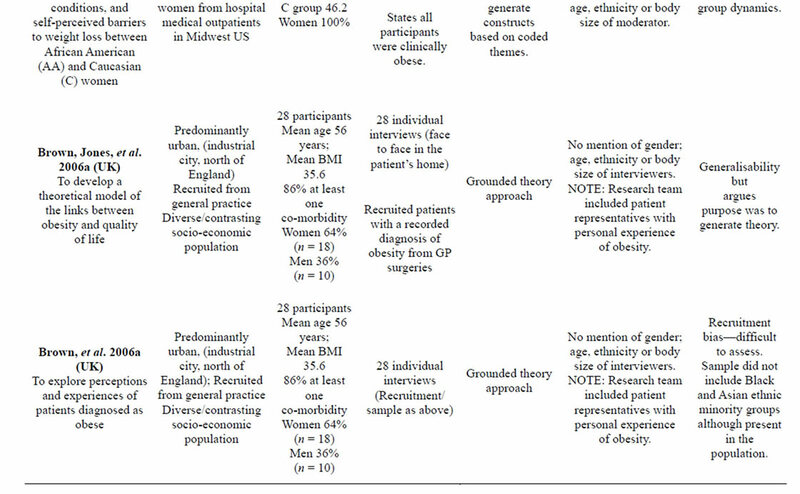 We eventually included 31 qualitative studies of obesity in which all, or the great majority, of participants were obese and data collection employed face-to-face methods. The studies were drawn from a range of disciplines after electronic, lateral and key journal searches covering the period January 1995 to July 2012. The databases included: AMED (Ovid); CENTRAL (Cochrane Library); CINAHL (Ebsco); Medline (Ebsco); PsychINFO (CSA); SCOPUS; Web of Science (ISI Web of Knowledge). Table 1. Illustrative search (CINAHL). to include synonyms, word variants, database labels and to remove duplicates and exclude studies not meeting our criteria. Only English language studies were included. After independently screening of 417 study abstracts, we were able to exclude the majority (356) because they were not a qualitative study involving adult participants. We appraised the full report of 61 studies and excluded 30 studies for the following main reasons: nine did not provide sufficient information about how data were collected and analyzed or about participant characteristics to be sure participants were mainly obese; seven the sample majority were normal weight or underweight; five the focus was not obesity with inductive analysis of qualitative data; five did not use face-to-face data collection methods; three the sample were not adults; and in one duplicate findings were reported in more detail in an included study. Methodology information was systematically extracted from the 31 included study reports and summarized in matrices for analysis. Both authors checked extracted data against the original study report. Both authors worked initially independently to identify and then agree on key themes and issues from the extracted data. Table 2. Summary of reviewed studies. Participants: 76 Mean age 41 56 with history or current obesity: 28 “Maintainers”; 28 “Regainers”; 20 healthy weight for comparison. 60 individual interviews Two group interviews. No mention of gender; age, ethnicity or body size of interviewers or group facilitators. Rural region of Malaysia Recruitment was by an announcement of the study through the village headman. 38 adults Age range 21 to 63 years. Six focus groups stratified to gender and ethnicity. Gender and race/ ethnicity considered; No mention of age, or body size of group facilitators. 30 adults Mean Age 39.1 years. Mexico and South/Central America Recruitment via flyers in community settings. 21 adults Age range 22 to 81 years. Transcripts analyzed by three independent investigators, one of whom was ethnicity concordant. Participants’ heights and weights were measured. South East region of USA Participants recruited from either Weight Watchers or Overeaters Anonymous. No specific mention of gender; age, ethnicity or body size although the researcher/author states she did all the interviews and mentions membership in weight loss organizations. Interviewer characteristics: researcher participated in the weight loss organizations that she recruited from. “This involvement may have had an influence on who agreed to be interviewed, as well as on the amount of information they disclosed”. To gain an understanding of the beliefs of overweight people about the causes of obesity and effective interventions to reduce it. 34 men and women age range 18 - 50 years. No details of gender, mean age, mean BMI. No mention of gender; ageethnicity or body size of interviewers. Participants self identified as being overweight. No mention of gender; age, ethnicity or body size of interviewers. Conducted by an experienced moderator. No mention of gender; age, ethnicity or body size of moderator(s). 24 participants 58% (n = 14) over 50 years. The interviews were carried out by researchers from varied health back grounds to determine whether this influenced the views expressed by patients. Interviewer characteristics: “some people may feel more comfortable about pointing out problems when the interviewer is not a dietitian”. 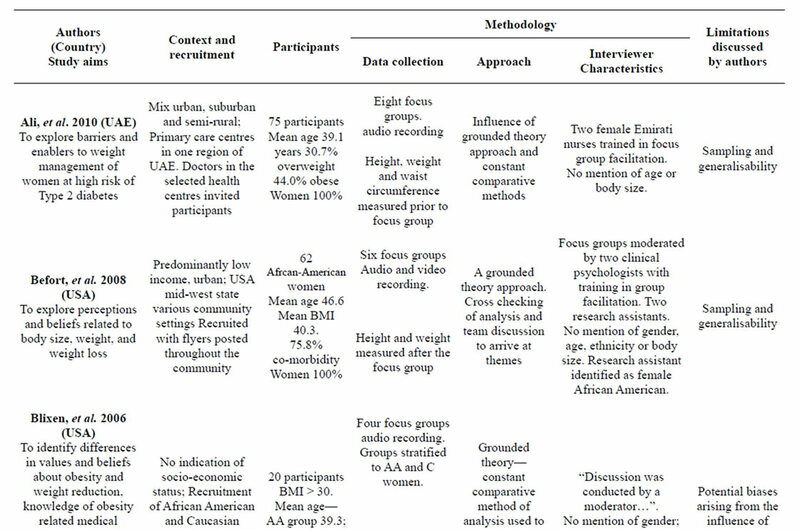 Six focus groups-self-reported height and weight to determine the BMI of each individual. Participants recruited from two general practice clinics in south London (n = 7) and through an organization providing support for those on Orlistat (n = 5). All participants had been prescribed Orlistat in the past year. All patients (n = 22) who had completed the questionnaire for a quantitative cross-sectional study of the impact of surgery on health status, were invited to be interviewed. 15 participants Mean age of 41 years. 12 individual interviews Seven face-to-face either at the interviewee’s home or at the general practice clinics, and five via telephone. 19 participants Age range 41 - 61 years. Moderator with “experience in the field” and trained observer. No mention of age, gender, body size of moderators. Psychological issues might have been better discussed in individual interviews. Participants were recruited from three general practices in Sheffield with socio-economically diverse populations using purposive sampling. 31 participants mean age 53 All with BMI > 27 All been taking a prescribed anti-obesity drug for at least two months within the previous two years. NOTE: Project undertaken with the support of two lay team members, each with personal experience of anti-obesity drugs. Recall bias, since a relatively long period (up to two years) might have elapsed since their experience of initial prescription. No mention of gender; age, ethnicity or body size of focus group facilitators. Total 90 participants Age range 21 - 66 years Mean BMI 36. No mention of gender; ageethnicity or body size of interviewer although author names himselfso male gender can be inferred. Accuracy of retrospective recall of experiences from about 10 years earlier. The study was conducted at a Family Medicine clinic at a southeastern academic medical center. Physicians referred 69 obese female potential participants between the ages of 18 and 70. Investigators contacted and screened 56 potential participants (29 Black, 27 White) by telephone for their willingness/ appropriateness for participation in the study. Facilitators were matched according to ethnicity. There was no mention of gender; age or body size of focus group facilitators. Investigators involved in the theming were from varied educational backgrounds including a clinical psychologist, a master’s level psychologist, a family physician and a pharmacologist. Part of a larger study looking at the health and social experiences of people living with obesity in Victoria, Australia. Individuals recruited using articles in local newspaper, convenience sampling and at a later stage purposive sampling techniques to diversify the sample. “Interviews were conducted by a team of five experienced qualitative researchers”. A brief report about the study was published in a daily newspaper in Victoria, Australia, to recruit a community sample of clinically obese adults. Community sampling methods were supplemented with purposive sampling techniques to ensure a diverse range of individuals were included. 142 participants Mean age 44.8 years Mean BMI 39.3. Author identifies herself as undertaking interviews. No mention of age, ethnicity or body size of interviewer. 16 participants Mean age 47.3 Weight history but not BMI. Indicates likely to be in obese category. findings. However, in passing, it should be noted that the majority (22 of 31 studies) highlight in their findings, at least to some degree, the influence of obesity stigma on participants’ perceptions and experiences. The majority of reports are from authors working in academic institutions in developed countries. Most of the studies are focused on urban populations in these countries. Recruitment settings are divided between community samples (16 studies) and primary health care, outpatient samples and hospital (15 studies). A mix of settings and recruitment strategies is used in the larger studies; some of the community based studies recruited participants active in commercial slimming programs. The sampling setting appears to have been convenience but several studies make a virtue of recruiting either patients or a non-patient community sample in considering the application of findings. Just over half (17) of the studies recruitment contexts are closely linked with interventions to lose weight—study interviews were within a weight management intervention. Overall 958 different individuals were involved in the studies (1206 participants if including repeat samples of same individuals within different studies). Women (78.8%) outnumbered men (21.2%) by a ratio of four to one. The best estimate of the mean age of participants is 44 years (mean age was not reported in all studies). Participants mean BMI could be estimated at 37 kg/m2 overall; again the mean is not consistently reported. Thirteen studies reported only a BMI range indicating obese participants. The socio-economic background of participants was not reported consistently. Understandably, given space constraints, very few of the reviewed studies reported their methodological approach in any detail but most summarize the approach with reference to established sources. However, in some studies it was difficult to discern any distinct methodological underpinning. Nine studies refer sufficiently to Grounded Theory to be clear that this was the main theoretical underpinning. Six other studies also refer to Framework Analysis and others to variants of Thematic and Content analysis. Notwithstanding the scantiness and apparent diversity in methodological underpinnings the actual practice of research was similar across studies. Purposive sampling of convenience populations with face-to-face group or individual interviews employed. Twenty one studies (67.7%) involved individual in depth interviews; the remaining ten studies (32.3%) employed focus group methods. Analyses proceeded through multiple stages refining data coding to support inductive analyses. All the studies involved participants who would be categorized as medically obese (BMI 30+ kg/m2). Information on interviewer characteristics was very limited as was discussion of reflexivity. Indeed 22 studies (70.9%) report nothing about the interviewer characteristics. Nine studies do provide some description, mainly of interviewer occupation, gender and ethnicity where this appears relevant to the groups being interviewed. Only three studies give attention to the body size characteristics of the interviewer. The reports from Chan and Gillick  and from Granberg  are both vague but indicate the interviewers experienced body weight problems themselves. The report from Diaz, et al. is the only one that is explicit in stating that the focus groups were conducted by one normal weight investigator and one overweight aide. The limitations discussed within the study reports are very weak as regards researcher reflexivity. Eight studies (25.8%) did not include any substantive discussion of limitations. The majority (20 studies, 64.5%) discuss limitations but only in conventional terms for qualitative methods: for example, of potential biases arising from self-selection and convenience sampling, of limits to the generalizability or transferability of findings from a small sample, of potential limitations of group as against individual interviews for acquiring personal views. Only three study reports reflected on how interviewer characteristics could have affected data collection processes and findings. Chan and Gillick  and Granberg  consider how their own characteristics may have affected recruitment and comfort of participants. Jones and colleagues  note that participants may have felt uncomfortable if the interviewer was also a dietician. As far as possible a comprehensive and systematic approach has been taken in this review of the methodology employed in qualitative studies of adults’ experiences of obesity. However, the diverse range and variable quality of studies has necessitated a more exploratory and open review method. A judgment was reached to include studies on the basis that it was clear that most participants were obese and the data were collected by face to face interview. We did not attempt to otherwise weed out weaker studies because we were not concerned with the findings of the studies but with their reported methods. Nevertheless, our review has brought out important issues for qualitative research methods with respect to obesity and allows useful but provisional recommendations to be made about the design and reporting of such studies. The COREQ guidance for assessing quality in research highlights the value of explicit details of the theoretical position and methods . The theoretical framework has consequences for the approach to establishing the quality and rigor of the study. Our review shows that were this to be strictly enforced then nearly a third of studies of obesity would fall short. However, researchers face a challenge within a short article to provide detailed methodological background. There is also the danger of articles reproducing long justifications that belong in epistemology journals rather than health and social research journals. The majority of studies of obesity provide sufficient pragmatic information appropriate to the publication context and most report clearly the study setting, sampling and methods of data collection with attention to quality issues within these methods. Likewise, on the whole, the reporting of data analysis and interpretation methods is to a good standard. A better consistency in reporting participant characteristics such as socio-economic background, mean ages and BMI is needed and this is further discussed below. Finally, among strengths, the studies present rich data delivering a depth of understanding of the experiences, in their own words, of people living with obesity. Nevertheless, these strengths must be set against limitations in sampling and a stark lack of researcher reflexivity given the focus of the studies. Whilst obesity affects all social groups it is important in the context of medical research to consider health inequalities more carefully. Inequalities linked to obesity are complex and shifting [14,51]. There is evidence for social class and ethnicity divisions in the prevalence of obesity and, very clearly, in the health consequences of obesity such as diabetes [51-53]. In common with most clinical studies, the qualitative research about obesity is likely to be biased to those who are better off, middle aged, better educated and without the more disabling comorbidities that make participation in research difficult. However, the socio-economic biases in particular are difficult to judge from the reviewed papers and this is an important limitation. Age and gender are more consistently reported. In most societies, obesity prevalence peaks for both men and women in late middle age; so it is perhaps reasonable that the qualitative research reflects a middle aged perspective. Less justifiable is the bias towards women in a ratio of four to one. Obesity is projected to affect a greater proportion of men than women [12-14,52] and it will be critical to understand the distinct perspective and experiences of men rather than generalize from studies of women. A further important limitation is the lack of attention to how interviewer characteristics influence data collection. Ironically, even the studies concluding that obesity stigma was a key finding did not attend to its potential impact on their own data collection. The evidence more broadly about stigma and obesity stigma in particular indicates that it is a deep rooted psycho-social phenomenon, not readily under conscious control . Communication skills to establish a good rapport with a participant and to maintain a comfortable and non-judgmental setting are critical in interview methods . Even so, researchers employing face-to-face methods must recognize that people are conscious of obesity stigma and, therefore, the interview interaction presents a heightened challenge as regards management of self and identity. Participants will almost certainly alter their responses to questions as against their perceptions of the size of the interviewer and other influences in the context of the interview. Of course, within a qualitative methodology there is no true or false simple reality—just a greater demand, as in the COREQ criteria, for reflexivity as to the contexts and influences on the data generated. Within qualitative research telephone interviews have generally been regarded as a weaker method, less able to provide rich data than face-to-face interviews . However, this general tenet appears to be based on assumptions about how people traditionally behaved using telephones rather than empirical evidence. Where telephone interviews have been employed (particularly with harder to reach groups and where a degree of social stigma may be present within face-to-face work) the reports of data quality are positive, and this includes studies of obesity [56-59]. The advantages of telephone interviews are worth reiterating. First, it potentially makes the study more accessible to participants reluctant to arrange a face-to-face interview; this may include men. Second, it removes the effects of the body size of the interviewer from influencing the data. Telephone interviews have potential, therefore, and might be considered in study design as an alternative to face-to-face methods. However, the evidence of advantages and disadvantages is still limited with respect to obesity. Methodologically pragmatic studies are improving understanding of the experience of obesity. The studies are of variable quality and the impact of obesity stigma, a deep rooted psycho-social phenomenon in most societies, has not been attended to in the methodology of these studies. 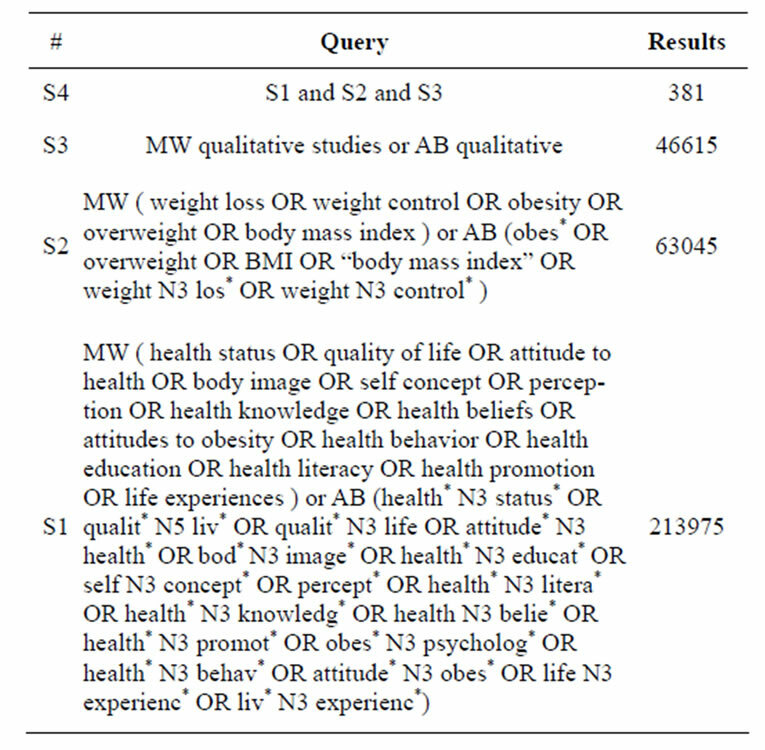 The implications for qualitative research of obesity stigma are therefore unclear. Researchers should consider the sampling biases in previous studies, particularly with a view to involving more men. Clearer information about study participants, including socio-economic background, would be helpful. Studies involving face-to-face interviews should report on salient interviewer characteristics including body size. In time, this will provide a clearer picture of how these characteristics might affect data collection and study findings. This study was in receipt of funding from the Collaborations for Leadership in Applied Health Research and Care for South Yorkshire (CLAHRC SY). CLAHRC SY acknowledges funding from the National Institute for Health Research (NIHR). The views and opinions expressed are those of the authors, and not necessarily those of the NHS, the NIHR or the Department of Health. Murphy, E. Dingwall, R. Greatbatch, D. Parker, S. and Watson, P. (1998) Qualitative methods in health technology assessment: A review of the literature. Health Technol Assess, 2, Monograph. Ritchie, J. and Lewis, J. (2003) Qualitative research practice. Sage, London. World Health Organization. (2000) Obesity: Preventing and Managing the Global Epidemic. WHO, Geneva. Foresight. (2007) Tackling obesities: Future choices. Government Office for Science, London. Brownell, K. Puhl, R. Schwartz, M. and Rudd, L. (2005) Weight bias: Nature, consequences and remedies. Guilford Press, New York. De Brun, C. and Pearce-Smith, N. (2009) Searching skills toolkit: Finding the evidence. Wiley-Blackwell BMJ Books, Chichester. Thomas, J. and Harden, A. (2007) Methods for the thematic synthesis of qualitative research in systematic reviews. ESRC National Centre for Research Methods, London. Brown, I. Thompson, J. Tod, A. and Jones, G. (2006) Primary care support for tackling obesity: A qualitative study of the perceptions of obese patients. British Journal of General Practice, 56, 666-672. Chang, C.T. Chang, K.H. and Cheah, W.L. (2009) Adults' perceptions of being overweight or obese: A focus group study. Asia Pacific Journal of Clinical Nutrition, 18, 257- 264. Sabinsky, M., Toft, U., Raben, A. and Holm, L. (2007) Overweight men’s motivations and perceived barriers towards weight loss. European Journal of Clinical Nutrition, 61, 526-531. Thomas, A.M., Moseley, G., Stallings, R., Nichols-English, G. and Wagner, P.J. (2008) Perceptions of obesity: Black and white differences. Journal of Cultural Diversity, 15, 174-180. Tod, A. and Lacey, A. (2004) Overweight and obesity: Helping clients to take action. British Journal of Community Nursing, 9, 59-66. King, N. and Horrocks, C. (2010) Interviews in qualitative research. Sage, London. Chapple, A. (1999) Issues in research. The use of telephone interviewing for qualitative research. Nurse Researcher, 6, 85-93. Burke, L. and Miller, M. (2001) Phone interviewing as a means of data collection: Lessons learned and practical recommendations. Forum: Qualitative Social Research, 2, 7.